House of Delegates District 21 is located primarily within the City of Virginia Beach with a small portion of it being in Chesapeake. 57% of the districts inhabitants are white, while 25% are black, 13% are Asian and 4% another race. The district, according to VPAP, became slightly more Republican after the 2011 redistricting, based on the share of the vote Bob McDonnell obtained in 2009. More interesting to me are the contests since then. Democrats Warner, McAuliffe, and Obama performed slightly better in this district that they did statewide, while Northam and Kaine matched their statewide efforts. Although the graphic shows them tied, Obenshain won the district by 132 votes over Herring. Other than that contest, Democrats have won this district. It is no surprise, then, that Republican Ron Villanueva has faced a challenge every cycle. Villanueva was elected by 14 votes in 2009. He defeated Adrianne Bennett in 2011 by 15 points, while spending more than 1.5 times as much – $351,000 to $218,000. Susan Hippen, outspent by more than 4 to 1, lost in 2013 by a more narrow margin – just under 9% – making this just one of 14 competitive* House races that year. No doubt that’s part of the reason why she’s giving it another try this year. At this time, it looks like another competitive contest is on tap. 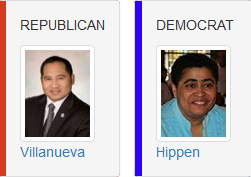 As of June 30, the two candidates have nearly identical cash on hand: $25,902.52 for Villanueva and $24,535.52 for Hippen. 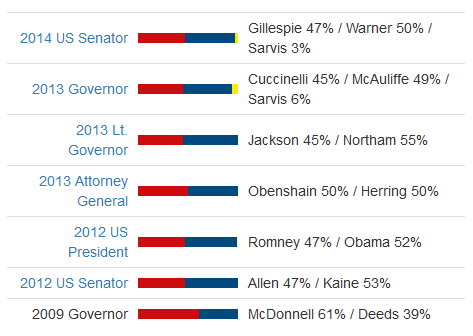 The demographics favor Hippen: if she pulls ahead here, this could be the most hotly contested race in Hampton Roads. I have this race listed as Leans Republican for two reasons. First, never discount the value of incumbency. Because of it, they generally have better access to the money and volunteers that challengers lack.